Stockings can add so much to your holiday décor. You don’t need a mantel to hang and enjoy them. I made pastel stockings to hang from my daughters’ bedposts year-round . . . a home for a surprise or treat to celebrate all kinds of special moments. A fleece stocking is especially cozy-looking and fun to make. Embroidering on fleece is easy if you know how. The challenge of working with fleece is the fabric nap. Stitches tend to sink in and disappear. To prevent that, all you need to do is put a piece of wash-away stabilizer over the top of the area you are going to embroider. This allows the stitches to settle nicely next to each other and not get distorted. If you are going to embroider a design that has a lot of filled-in areas, you can use a piece of tulle instead of wash-away stabilizer. The tulle can be trimmed away from the outside edge after the embroidery is complete, but it will stay permanently behind the stitches, offering long-term protection. To make my stocking, I chose a swirly design (from Embroidery Online) that does not have a filled area. Open designs are perfect for fleece because there’s no need to worry about the nap poking through. 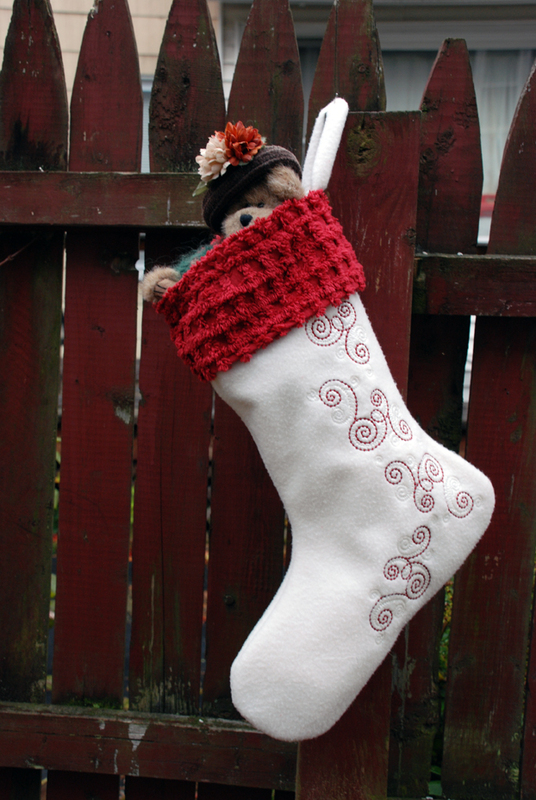 If you want to use my stocking pattern, click here. Start by cutting the stocking using the provided downloadable pattern, or you can use any stocking pattern you already have. Lay the pattern piece on a double layer of fleece and cut two at once. Cut the lining fabric the same way. Notice that the pattern has a 1/2-inch seam allowance. This makes it easier to sew without missing one layer if they slip a little. You can trim it to 1/4 inch after sewing the stocking together. Import the chosen design into your embroidery machine. I hooped a layer of mesh cut-away stabilizer and used temporary adhesive spray to adhere the stocking into the hoop. Then I positioned a single design on the screen and copy/pasted three more to get a pleasing overall design. Depending on the size of your largest hoop, you may need to rehoop to embroider the length of the stocking. Layer a piece of clear wash-away stabilizer over the fleece before embroidering. If you have a baste-in-the-hoop feature, secure the wash-away stabilizer to the top of the fabric. The wash-away stabilizer helps the stitching to form nicely on the surface of the fleece. Gently pull the wash-away stabilizer away from the embroidery edges. Use tweezers to remove small pieces of stabilizer from between the stitching. Remove the embroidered section from the hoop and lay it right side down on a cutting board. Trim the mesh stabilizer to be even with the outside edge of the stocking. Sew the stabilizer into the seams when sewing the stocking together to help keep the embroidery design from stretching out of shape. With right sides together, pin the embroidered stocking front to the stocking back. Also pin the lining front and back, right sides together. Use a 1/2-inch seam allowance to sew the stocking and lining together. Clip notches along the outside curves. This will give the toe and heel a nice shape. Along the outside curves, clip notches. Clip the inside curves to get a smooth shape. Be careful not to clip through the stitching. Trim the entire seam allowance to 1/4 inch to reduce bulk. Use a rotary cutter or scissors to trim the seam allowances, being careful not to get too close to the stitching. Cut a rectangle measuring 4 inches by 19 inches from the contrasting fabric to make the cuff. Turn one long edge under 1/2 inch. To make the cuff, cut a 4-inch by 19-inch rectangle from a contrasting fabric. Topstitch the hem in place to finish the cuff’s lower edge. Fold the cuff in half, right sides together, and sew the short ends together, completing the cuff. Now it’s ready to attach to the top of the stocking. My chenille fabric had a built-in grid, so I used it as a cutting guide to get an even chenille pattern across the cuff. The grid also served as a guide for hemming the lower edge. To make the loop for the stocking, cut a 2-inch by 9-inch strip of fleece. Fold in half lengthwise and stitch using a 1/2-inch seam allowance. Trim the seam allowance to 1/4 inch. Turn the tube to the right side. If you have a Fasturn Set, check out Shannon’s post for how to use the tool. If not, here’s an easy way to use a screwdriver to turn a short tube. Turn the ends into the opening and use a small screwdriver to push the ends in farther. The screwdriver’s metal tip catches on the fabric and pulls the end in as the screwdriver is pushed farther into the tube. When you can’t push the screwdriver in any farther, start to smooth the outer portion of the tube toward the handle of the screwdriver. It takes a few seconds to push the outer portion of the tube out of the way to see the end at the tip of the screwdriver that’s turned to the right side. Remove the screwdriver. Hold the left end of the tube that’s turned to the right side firmly, and smooth the rest of the tube to the right side. Matching the raw edges, position the cuff at the top of the stocking, wrong side of cuff facing right side of the stocking. Position the loop so that the ends are centered to the left and right of the seam that’s over the heel of the stocking. Baste the loop in place. Baste the loop in place. Turn the stocking lining inside out. Matching the raw edges, place the lining over the right side of the stocking and cuff. Pin in place along the top edge. The cuff and loop are sandwiched between the stocking and lining. Stitch all the way around the top edge, leaving a 4-inch opening. Start and stop in the back of the stocking so the opening will be in the back. Pull the stocking through the opening. Use a point turner to smooth the curved shape of the stocking before you stuff the lining into the stocking. Pin the opening closed. Press the cuff into position, making a crease. Topstitch along the edge of the fleece stocking, closing the opening as you stitch along. The topstitching will keep the lining and cuff in place and secure the ends of the loop.